Imprint Method: 1 Color 1 Location - A masterpiece of design and functionality, the Brindisi desk clock is designed with gimbaled movement and features a thermometer and hygrometer. 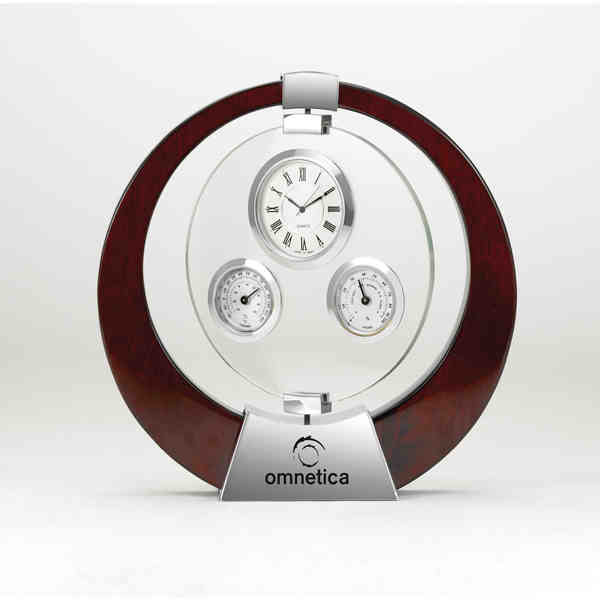 Elegant Roman numerals, a second hand, and a rosewood frame with silver metal complete its design. A handsome decoration for any setting, it makes an excellent gift or award. Measures 7 1/2 x 7 1/2 x 2 in dimension. May be purchased blank or customized with your company name and logo. Size: 7.5 " x 7.5 " x 2 "
Price Includes:PLEASE NOTE - EXCEPTION TO THE ABOVE: This item is available with a lasered imprint only.